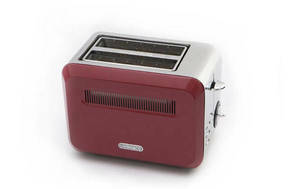 Snapshot: The Living & Co Vintage Collection 980W VTLC is a 2-slice toaster with a frozen setting but no crumpet setting. Is it the best thing since sliced bread? Excellent at producing consistently toasted bread. Excellent at toasting frozen bread. Good at toasting a single slice. Crumb tray is easy to pull out and clean. Just OK at browning evenly. Poor at toasting Burgen bread.